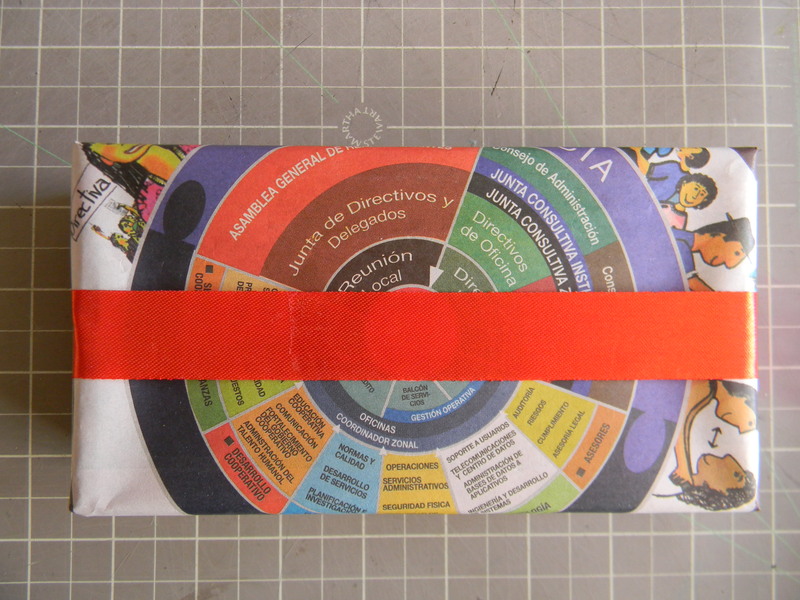 Whether you live in Ecuador or not, don’t spend big bucks on gift wrapping this holiday season. I promise you don’t have to. In fact, you can have more fun and make a more lasting impression on friends and family by packaging from trash you have cluttering your house—stuff that can be up-cycled into simply smashing wrapping. Did you know that over the Christmas holiday Americans generate 25% more trash than they do on an average week? It’s sad but true. Last year I did a similar post that focused on using recycled trash available in US. 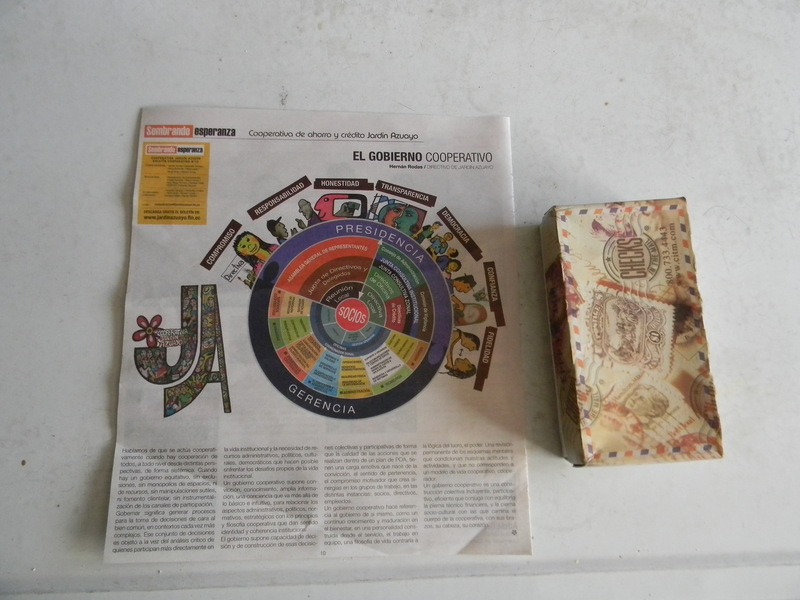 This year I’ll use scraps I’ve found in Ecuador, also. Salvage a flyer you might have been handed on the street and make it the paper you wrap around the outside of your gift. Use recycled red (or any other color) ribbon to decorate. I added a strip of Japanese paper tape. (I’ve seen some in the local, Coral Super Market.) You can also use an additional piece of ribbon. I added a piece of green painter’s tape in the opposite direction. You can use duct tape, also. (It’s available at Coral in many colors.) If you have neither of these, try a scrap of green ribbon. 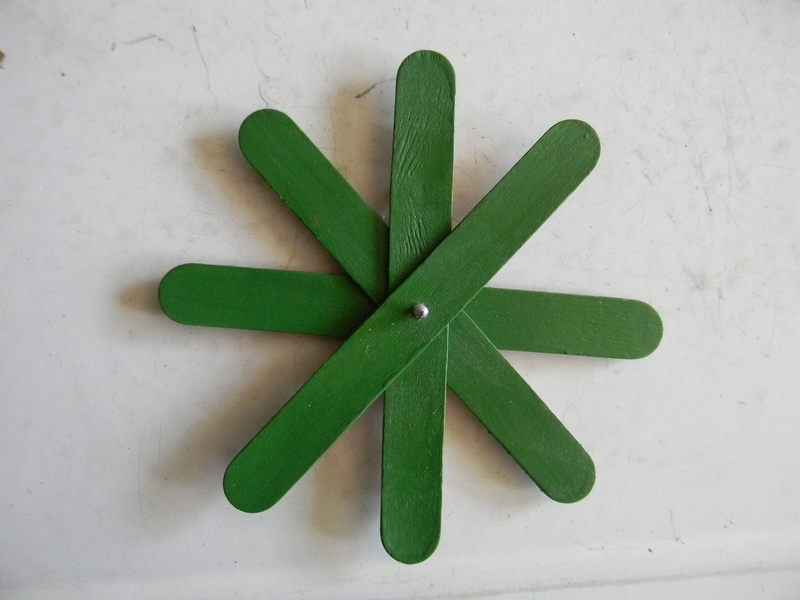 I recycled popsicle sticks, painted them green, and used them to create a star. 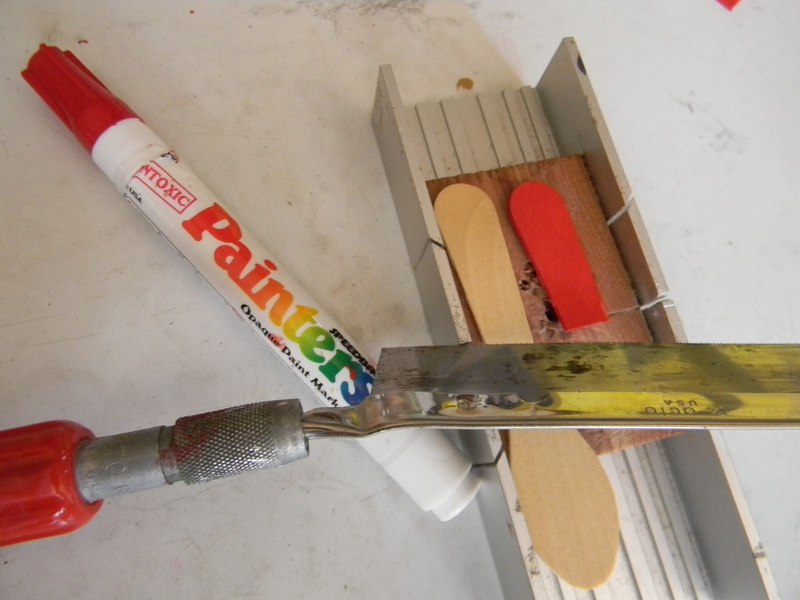 (You can find pre-painted popsicle sticks at Coral for a few cents a piece.) I drilled holes in my sticks and screwed them together. 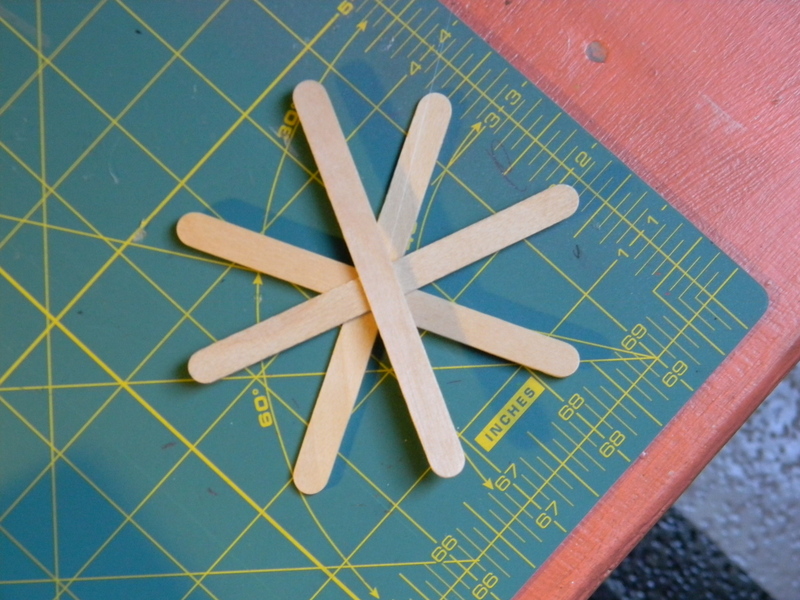 However, you can also use a hot glue gun to assemble your star. 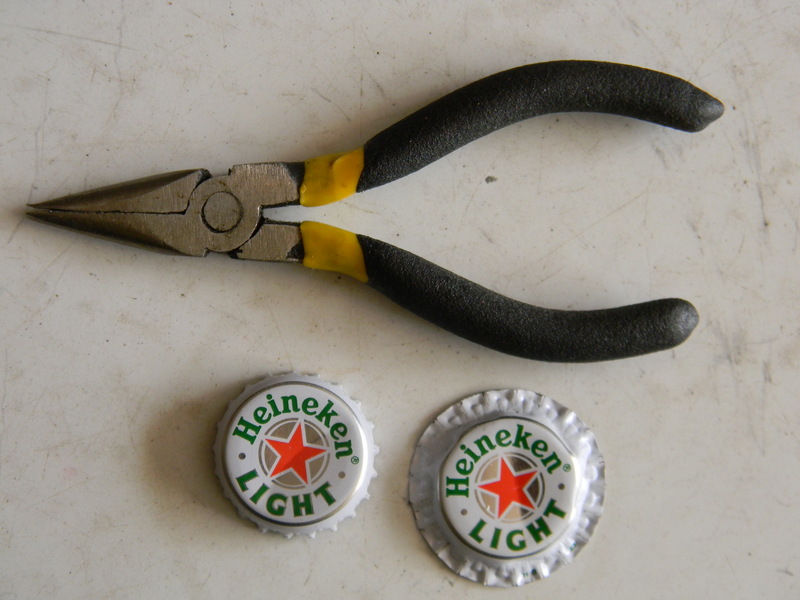 Or you can put holes in them using a hammer and nail, if you don’t have a drill. 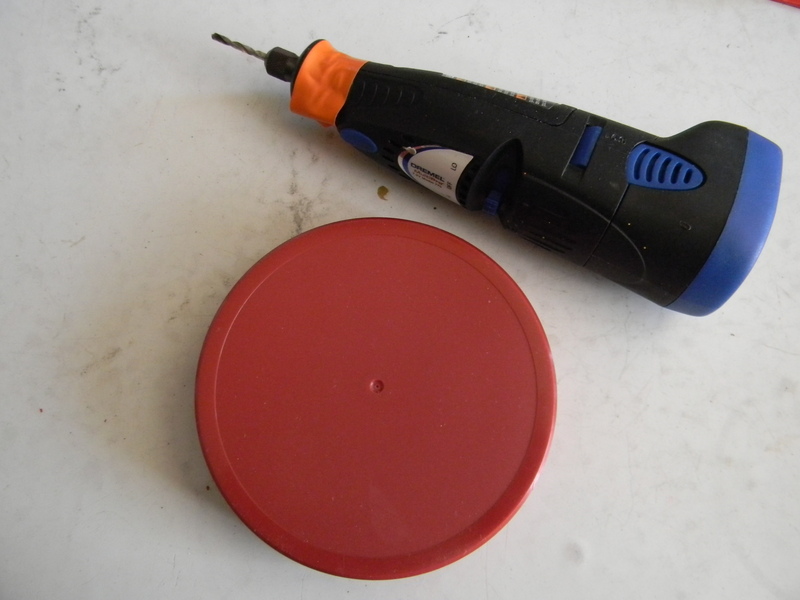 I recycled a red, plastic lid for the base of my “star” and drilled a hole in it. 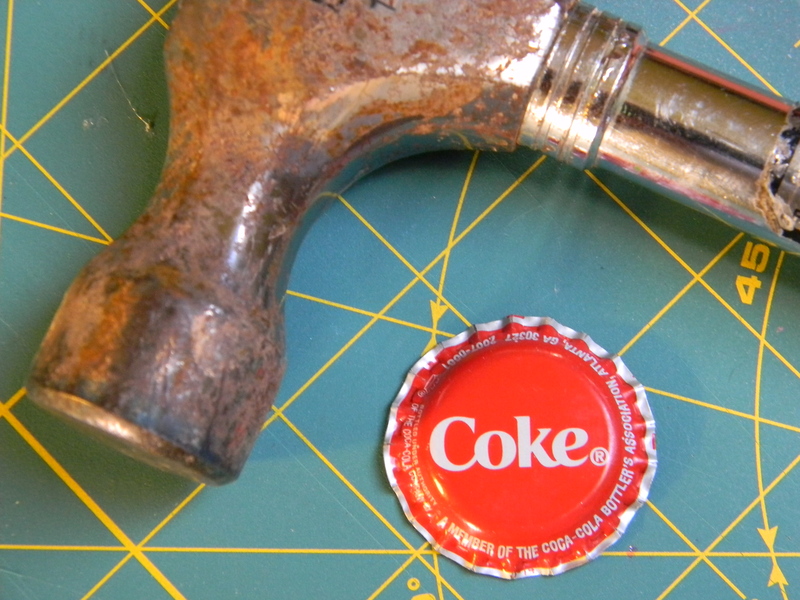 You can hammer a hole in it using a small nail, as well. 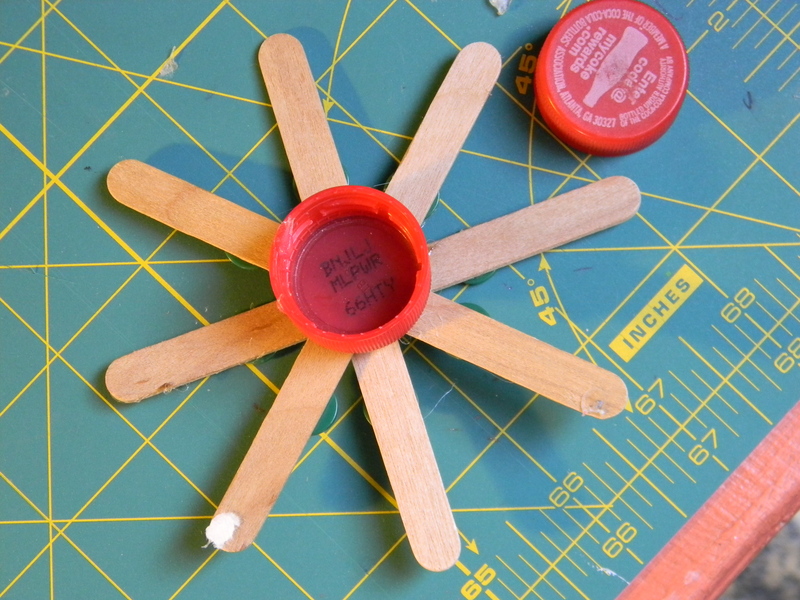 You can then screw the star to the red lid, or you can use a hot-glue gun to attach it. 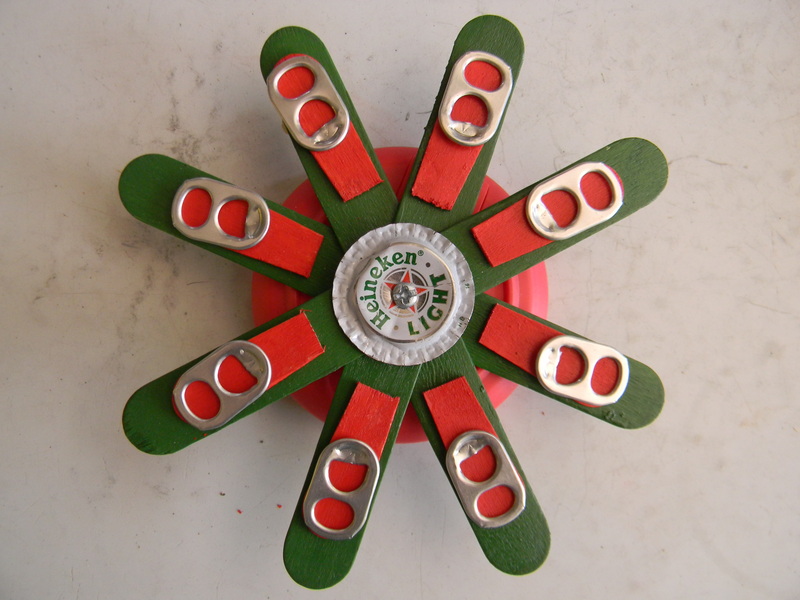 I, finally, applied tabs from Coke cans to the red pieces of wood. 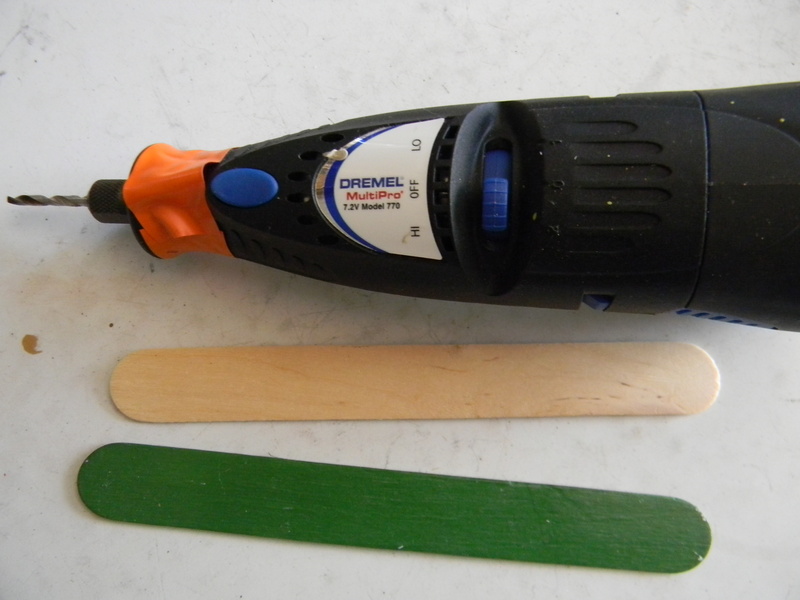 I used Elmer’s glue I happened to have on hand; you could use a hot-glue gun here, as well. 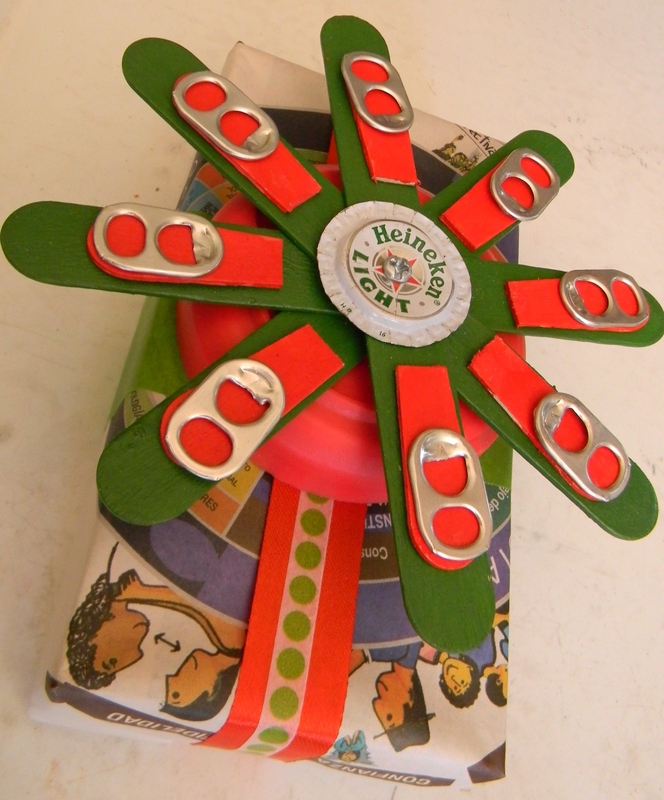 Attach the completed star to the gift using a hot-glue gun or wire. 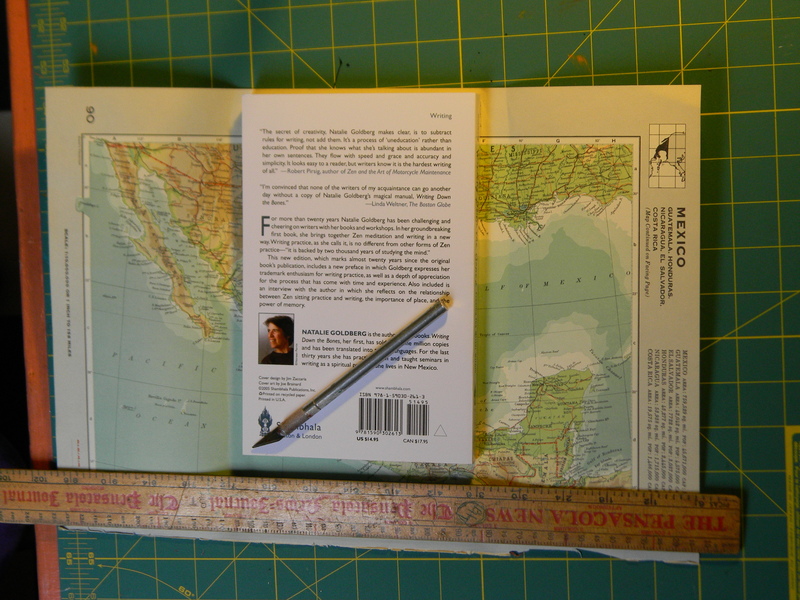 Next, I’ve included instructions for doing a similar kind of project in the US. 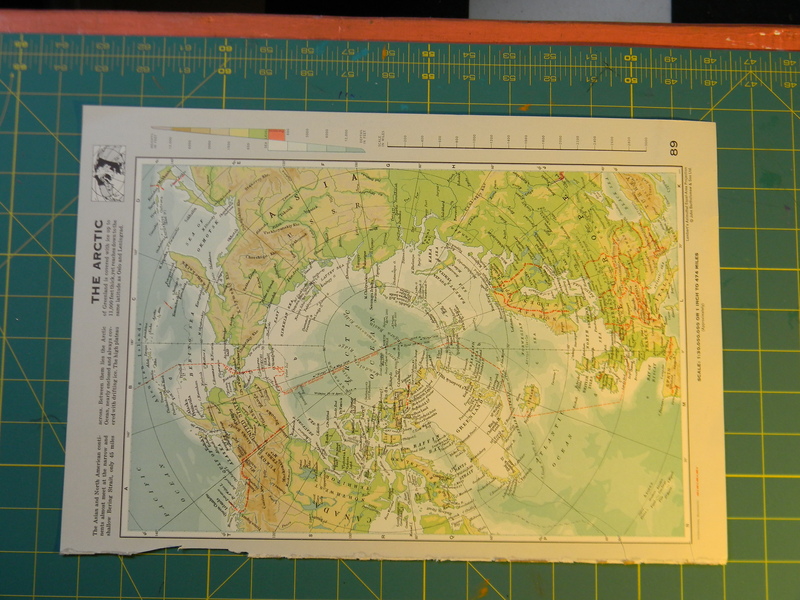 Find an out-of-date atlas or any other kind of map you might have discarded as no longer useful. 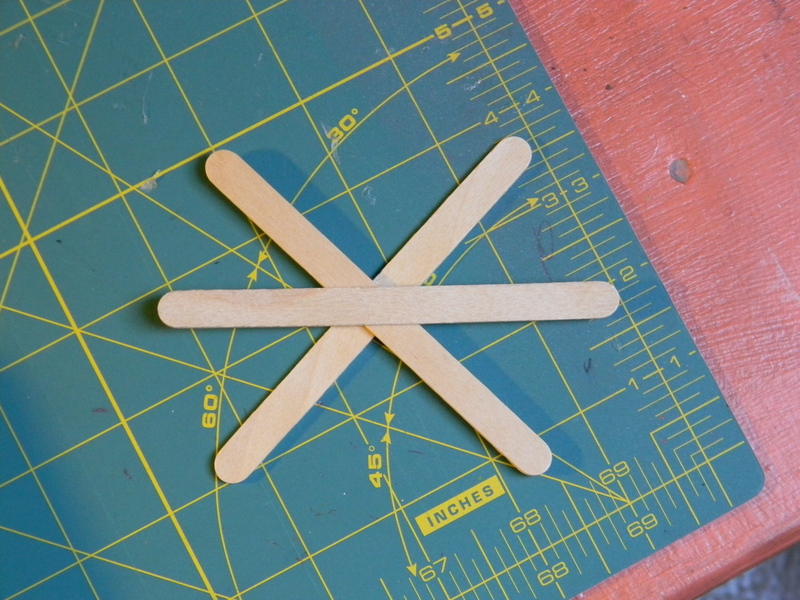 Hot glue popsicle sticks to create a star. 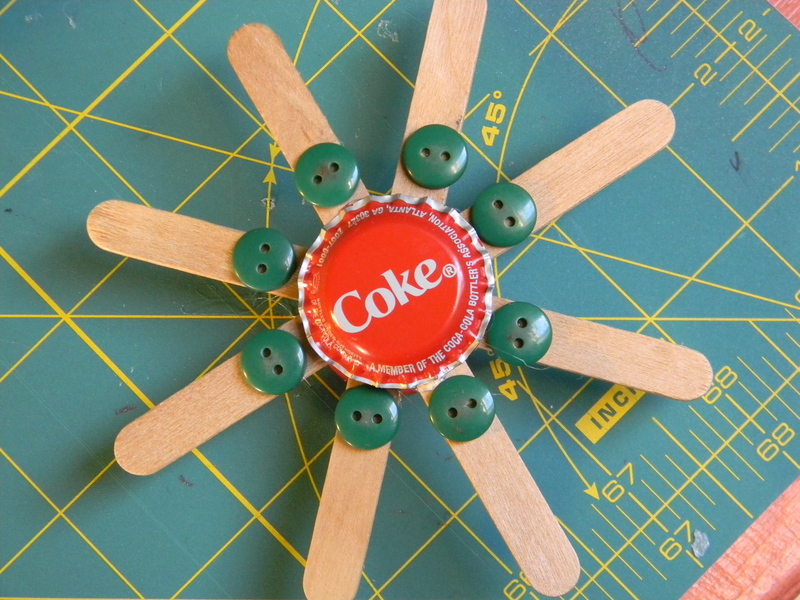 Hammer the edges of a discarded coke cap flat to create a ruffled look. 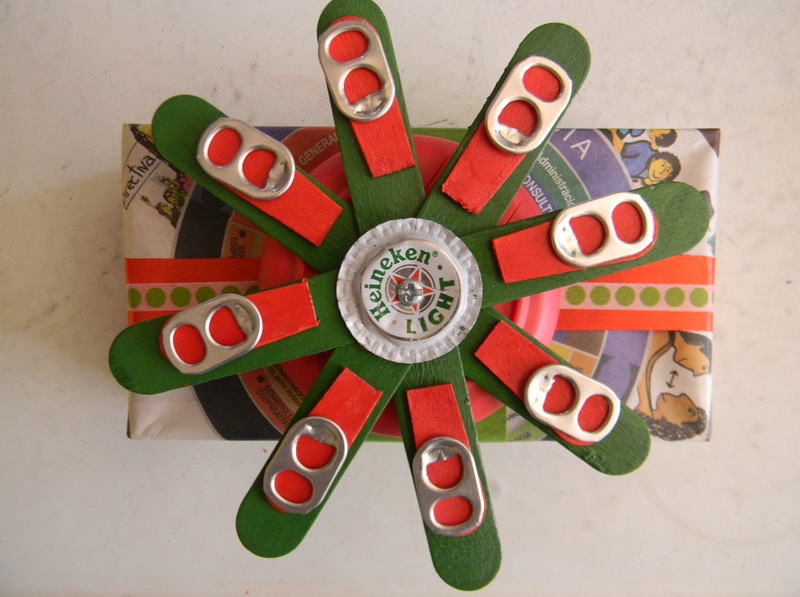 This entry was posted in art, Holidays, sustainability and tagged Christmas, Cuenca, diy, ecology, Ecuador, expats, gift wrapping, green design, holidays, recycling, sustainability, upcycling. Bookmark the permalink. Hello, no I have not done any extreme gift wrapping. After reading your post I definitely know that I lack that creative gene since I thought what yours was beautiful but simple at the same time. I did my Christmas shopping last week Friday. Oh, Colin, congrats on getting the shopping out of the way. I can’t remember if you were still in the US then. That would mean a close encounter with Black Friday. Yikes! But shopping on St Martin would be a TOTALLY different experience. Talk about shopping extremes. I’m developing a case of whiplash just thinking about it! I bet you could do extreme wrapping. ANYBODY can. Don’t let that “oh-I’m-not-creative” thing get in the way. Bet you could find some cool stuff to wrap with on Saba. I did do Black Friday and let me tell you it was not fun. I am working on a post to talk about shopping in Saba and St. Martin. I can’t wait for that one, Colin! I think it will be so fun. It’s sometimes those everyday details of life in another country that are most interesting. At least for me! Hugs to you, too! buenos dias, i love this post! my favorite gift wrap is banana foliage, tied with a wiry vine and garnished/ paired with wilt-resistant flowers liike helionias. i’m commenting using the reply from the inbox, as the connection is too slow to send it the ‘normal’ way. one of these days my path will take me to cuenca. i’m sure you and sarah are smiling your way through each day! Oh, Z, I’m so happy to hear from you. The banana leaf thing sounds TOTALLY cool! I’d love to see a photo of something you wrapped that way. I bet it was awesome. Gosh, I’m thrilled to hear about your visa! What a relief. I know how totally thrilled Sara and I were when we got ours. Interestingly, we were the first gay/lesbian couple in the Cuenca office to have one “esposa” dependent on the other. We set a precedent. But the art one is even cooler. Good luck with Mindo. We’re looking at a trip to the beach in February, probably, and will likely come your direction. Hopefully, we’ll get together sooner rather than later. Your holiday gift wrap sculptures are excellent. In my business of selling old things, https://www.etsy.com/shop/assemblage333?view_type=list, as my British, artist friends Kathy and Alastair call, “Selling Rubbish”, I always use all that,”junk mail”, to pack and ship. I’m constantly dumpster diving to procure cardboard boxes, although it’s great when I come up on a new neighbor ready to dispose of thirty-six moving boxes and suggest, “May I save you from those?”, before their refuse makes it into the dumpster. My writer friend Samantha Mozart, who also follows your blog, http://salmonsaladandmozart.com/, always saves the cartons her books are shipped in for me to recycle. I too made sculpture this week, at the, http://www.knockdowncenter.com/, in Maspeth Queens NY, the event called for entries in a non-denominational Christmas tree sculpture. Of course all the entries were assembled from all sorts of up-cycled items; mine consisted of iron, mirror, tin, wood and cotton cord, with a few plastic rosaries from the fifties tossed in. I’ve always admired unusual wrappings, some being, newspaper print or brown paper bags tied with bailer twine, tin foil, and old wallpaper. Recently I received a gift wrapped in sandpaper; I was quite impressed. 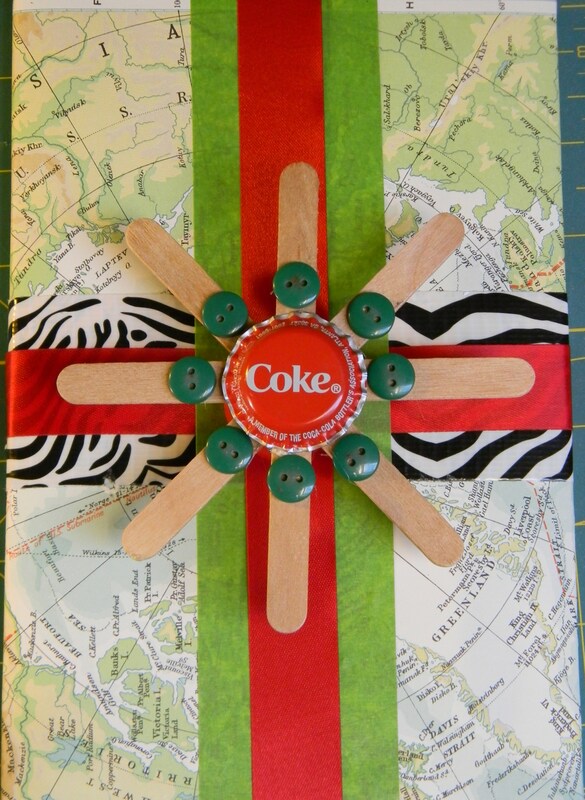 Your gift wrapping ideas are inspiring, thank you for posting. Oh, Robert, you’re the coolest! Totally awesome stuff on your Etsy page! Wish I were in the US, so it would be affordable to buy a pool ball with the number 5 on it. Sara’s favorite number is 5. Saw all of your 8 balls and the number 3. It would cost a fortune to ship it here. I would LOVE to see your Christmas tree sculpture. I went to that the link but didn’t see the trees. Any chance you took a photo. I have thought about building a tree of my own this year, instead of buying one. Interestingly, sandpaper is on my list of things to try wrapping with. SO cool you got a gift wrapped in that. Gotta run now, but we can chat about all of this later. I’d love to see more of your finds and your assemblages!!!!!!!!!! sorry; the normal way to reply to comments is not working on my slow internet! scroll down, and you’ll see the banana-leaf wrapping! No problem, Z. This is working perfectly. Will go check out your link. LOVE it! Jeff, wouldn’t it be awesome to print your own paper?! I am totally in love with that idea. I have a blogger buddy whose wedding we attended last year, and I took the invitation and enlarged it massively to wrap the gift I made her. It was fun! How fun that you have all of that old stuff. I’m SO into finding new ways to use old things. LOVE hearing from you, Jeff. Hugs to you too, my friend! Hope we get to meet one of these days! I love your creativity with found objects, Kathy. Thank you, dear Lisa. I’m so happy to hear from you. Hope the semester is beginning to wind down for you. When are you going to come visit us? We have to have you come, so a tree can fall on the house and electricity can go off. LOL God, that was a crazy experience. Wasn’t it?! Are you sure you want me to come? That sounds like you are taking a huge chance to have me. I would love to visit, but right now life is up in the air as usual. Of course we want you to come!!!! Like YOU really made the tree fall! And even if you had that kind of power, the accident turned out to be a HUGE bonus when we went to sell the house. We got lots of work done for next to nothing from our home owner’s insurance. There was SO much that needed to be done on that side of the house to begin with. Clearly, the tree gods were with us. I know about life being up in the air. Just let us know when you DO want to come. We’d love to have you! It was SO destiny, and I get to think of you every time I tell the story! That makes it even more fun. We lost our water here today. Do you have any powers in that department? LOL Love you, Lisa! Thank you for the wonderful tip – I hope people take you up on that. We use gift bags and boxes and keep re-using them. No wrapping paper at all. My sister made bags this year from colorful material. I am so against buying wrapping paper that isn’t recyclable. SO glad you appreciate the ideas. I haven’t bought wrapping paper in ages–except at a garage sale a couple of years ago. Love the idea of making gift bags. I should try that one of these days. Great to hear from you today. Thanks for stopping by!!!!! Kathy, you are so clever & creative. I dont have the patience to do what you do. I do enjoy seeing your recipe, ingredients, and ways to use trash. I feel like I’ve accomplished something just removing trash from The Mountain; the Jr. College kids come out here to drink beer on top of the mountain (on the road); every morning, I pick up that nasty stuff which includes condoms, chewing tobacco tins, McDonalds sacks, frequently a lone tennis shoe. Once, I found a twenty dollar bill; just a week ago, I found a girl’s credit card. They bring all kinds of sledding objects when there is snow, then leave them where they land…burlap sacks, cattle feed containers, big round plastic sleds, trash can lids: I have to take the lawn tractor-trailer to get these bigger items off the mountain. It a full time job. I dont have time leftover to make wrappings. I feel so much better having ventilated; thx for the space to get rid of my frustrations with TRASH. Gosh, JK, that sounds like a pain in the you-know-what! Is there no way to keep kids out? I think I’d be hating trash, if I were you. NO wonder you don’t have to time to do creative things with the surplus. You’re drowning in surplus! The credit card find is a hoot. Great to hear from you, JK. Hope you had a wonderful birthday! 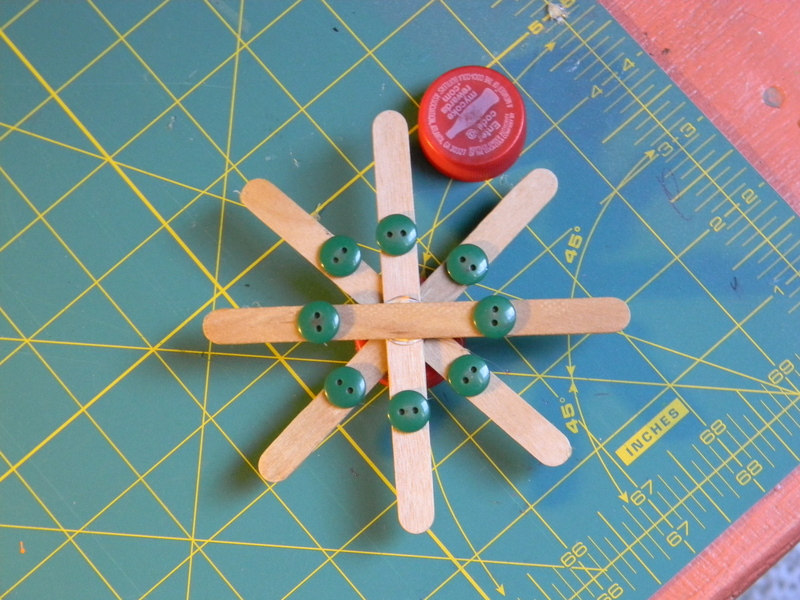 Kathy – I adore your post’s title, the photos, and user-friendly instructions! Further, you have GOT to be the most creative, re-purpose, up-cycle, earth-friendly person that I know! So glad you liked the title. I love playing with sounds. Kind of cool that holiday and ecology have so many similar ones. Thanks for reading, Laurie, and THANKS so much for tweeting my stuff! You rock! I have never — and I mean NEVER — seen anybody be more creative and thrilling in their present wrapping!!! I want to get a present from you some day (but where in the WORLD do you find the time to do all this???) 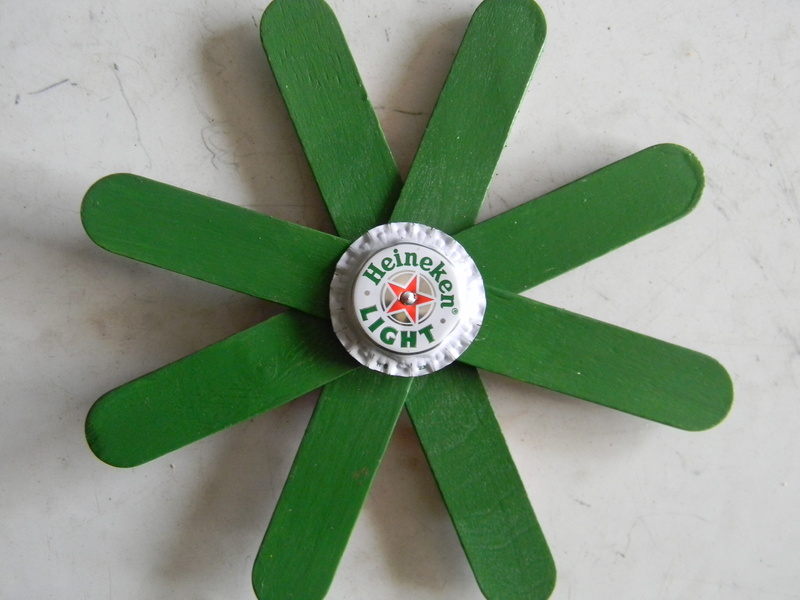 LOVE your passion for recycling and making something beautiful out of stuff we all throw away!!! Happy Holidays!!!! Hi Betty, wonderful to hear from you! I don’t know where I find the time either. The fact of the matter is that I barely do find enough. There just aren’t enough hours in the day. I’ll be sure you get a gift from me one of these days. Thanks for stopping by! Gosh, thanks for sharing the link. I had missed that post. Looks like you did it the week Sara and I were in New York getting married. They would make for excellent wrapping paper! Wonderful and inspiring, as expected! Thank you, Kathy, you keep all of us on our toes…no excuses not to think trash, waste and scraps for gift wrap, with your beautiful results and perfect instructions! Thank you! Thank you, Cindy. You’re a sweetie. I’m not as great a recycler as I should be. I think I’m mostly in love with the notion of repurposing and reinventing. I have NO idea where that comes from. If it helps the planet a bit–then that’s awesome! Great to hear from you. Stay warm up there in Michigan! Thank you, Charlie. It’s always fun to see what I can come up with every year. I love having had readers for as long as I’ve had you. Have a wonderful week, my friend. Oh, I’m glad you enjoyed these ideas. 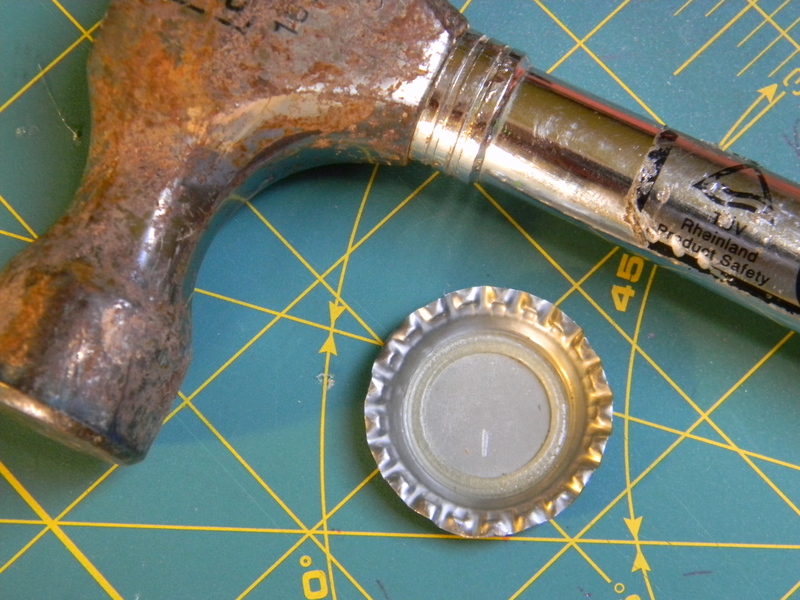 I think metal bottle caps, whether on beer or Coke, can add a bit of sparkle to a gift. They’re like the jewelry on the package. Great to hear from you today! Hope you’ll come back again soon! Thanks so much, Michael. I’m glad you appreciated my projects. To be honest, I have NO idea where these ideas come from. Must be from the crafting gods. LOL Wonderful to hear from you today! Oh, I love you, Sista! Love your belief in me. You’re right. I should do something with this. You’re not the first person who has said that. However, I have sent out several essays this fall–all of which have been rejected. My batting average is hurting right about now. Still, I appreciate the encouragement, my friend. Don’t give up! You just haven’t found the right home for your awesomeness! Thank you, dear Sista. I won’t! Are you back from your sisters’? How are they both feeling? Great to hear from you today!!! I am back in Qatar Kathryn. I ended up extending my stay as my little sister – the donor – had a slight blip in her recovery and ended up back in hospital, then needed a bit more TLB (Tender Loving Bossiness) from me! She’s much better now, as is big sister, who is still wowing the docs with her progress. I think I’m going to use some of your ideas for Christmas decorations too. l’ll make sure to photograph the results so that you can have another laugh. Sorry to hear your younger sister struggled with a set back, but THANK GOD she got the bossiness cure! Sometimes that’s all it takes–as an older sister myself, I know ALL about that! But it’s good to know you’re “home.” And I’m excited to hear you may try a few of these ideas. Hope you have a wonderful weekend, Kirsten! You always impress me with your craftiness, Kathy – even south of the equator! You are the queen of recycling and turning one man’s trash into your own personal treasure. Keep up the good (and festive) work! Thank you, Mark. I appreciate your confidence in my creative skills. As I just said to someone else, I forgot to mention how close I come to accidental amputation during some of these projects. You know what a klutz I am! So are you going to do any extreme gift wrapping this Christmas? I bet Tara would appreciate it. LOL NOT! Kathy I love love love your vision. You amaze me. You don’t just see colors, you see art. You create art. Absolutely Amazing! Thank you, dear Colleen! You always make me feel so good. 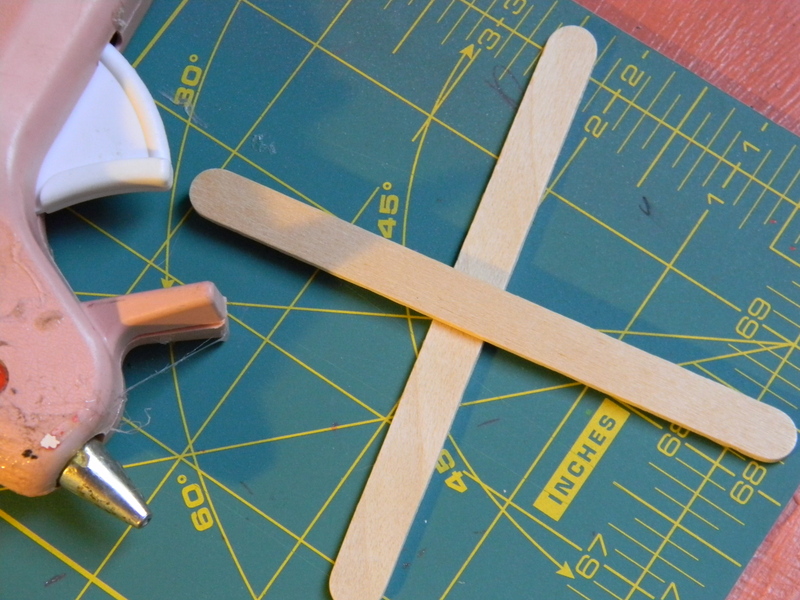 Are you going to do any great crafting this month? Can’t wait to put the ornament you made me on the tree this year. Of course, it made the trip with us! Hugs to you too, my friend! Sounds like fun! I wish now that we hadn’t sold so many of our tool and had put more into our container. I think that was not a wise move–literally. I’d say toilet paper wrapping if pretty extreme, Megan. You’re really creative, I bet you could come up with some other great ideas, also. Have you started your holiday baking? What are you going to bake this year? Hmmmmm–I’ve never had mince pies. I have NO idea what they even taste like. Save me a piece. I had NO idea that the “mincemeat was actually a kind of fruit filling. I LOVE learning this. Thank you SOOOOOOO much for letting me know. I’ve been misunderstand what that was for DECADES!!!! You’re a dear. Here’s my dirty little secret: I am actually the worst present wrapper you’ve ever met. All my presents look like a 5 year old wrapped them. Actually a 5 year old could do a better job. I don’t believe you could be THAT bad. Plus, it’s the thought that counts. It’s good to hear you enjoy the crafting posts. Actually, I thought about teaching something along these lines here this month. I just couldn’t decide if I had the time. Where does the time go? Are you and Reggie going to Tennessee for Christmas? This is fantastic Kathy!!!! You are so incredibly creative! Now to share!!! Thank you so much, Nicole! You have made my day. I SOOOOOOO appreciate your sharing!!!! Hope your week is going well! It’s wonderful to hear from you! Thank you, MJ. So glad you enjoyed the post. I look forward to checking out the post you mention. I wonder if your mom recycled because she grew up during the depression. My mother wasn’t born until 1938, but I think she still got some remnants of that mindset. Hope your week is going well! Great to hear from you. That’s completely the reason, she was born in 1930. Never had extras. Ever. SO glad you enjoyed the post, Dana. How fun that you have my ornament out for the holidays. That makes me happy to hear. Hugs to you, my friend. Hope you’re having a great week! It’s like two gifts in one. There’s the actual gift, of course, but the wrapping itself is such a treasure. You’re so talented, Kathy! It’s funny that you mention that, as often that’s exactly what my family says. However, sometimes they also say they don’t want to unwrap the gift, as they feel like they’re destroying something. Thanks for your sweet comment, Terri. You’re a dear! Your comment made me laugh. Yes, I am AT IT again. That’s a perfect way to describe it. It’s wonderful to hear from you, Jenn! I wish I had the creative umpf like you have! You’re way creative. You’re a writer! Kathy, you are the Martha Stewart of Cuenca. I am the Oscar Madison of wrapping. This crafty, clever, arty style wrapping of yours is so not happening with me. I have my gifts shipped to my sister and I wrap them at her place with whatever wrap she has lying around her house and I do it at warp speed. She does buy the recycled stuff, but I’d just as soon wrap everything in newspaper, tie it all with twine and fuhgeddaboudit. How wonderful! And what a great idea. I have done wrapping that didn’t use wrapping paper but that’s because I’m not organized so resorted to using newspaper or something that could pass. I’m with you, we need to stop wasting paper. I almost didn’t send out Christmas cards this year, but then decided to use cards I already had. Some say happy birthday, Valentine’s Day or what not. I’m sure my friends will roll their eyes since I’m always going on and on about the environment. I admire your skills! Wonderful. And thanks so much for the lovely review on Marionette. It means a lot. I was delighted to write the review and have a chance to read the book! I LOVED it. I especially love that you sent out any and all occasioned cards for the holiday. That is a hoot! And absolutely perfect! 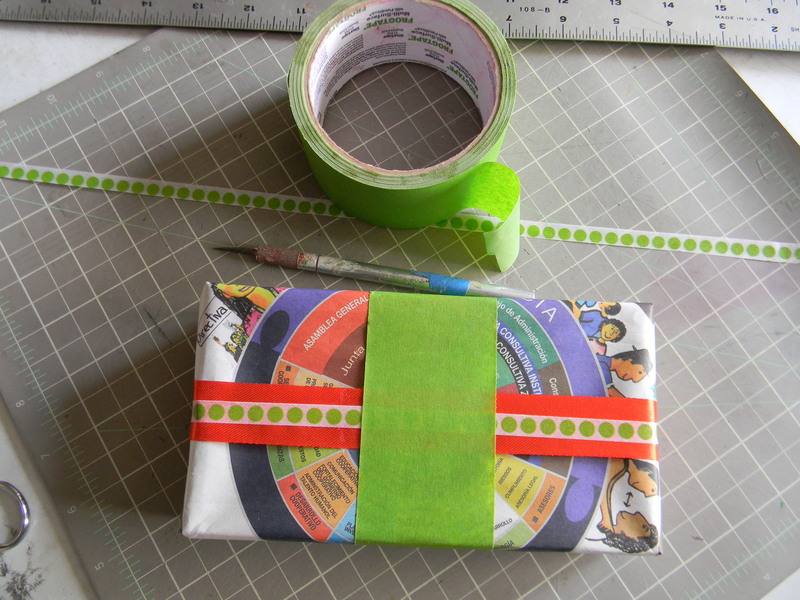 So glad you enjoyed this post and my crafty, wrapping ideas. Have a wonderful day, my friend. Wow Kathy! What a mesmerising series of step by step instructions! You make everything look fantastically simple 🙂 Lovely inspiring post. Thanks so much, Mun! Great to hear from you today! Glad you enjoyed the post and the directions. It really isn’t that hard to do. I promise. Hope you have a wonderful weekend, my friend! Those are awesome!!! I hung up my sweet cat food can ornament in my kitchen on Monday and I think of you whenever I pass by it!!! You are so talented and green!!! I knew you would be finding some great things to recycle into your beautiful artwork in your new country!!! Thanks so much, Beth Ann! I’m delighted you’re enjoying your cat food can ornament. 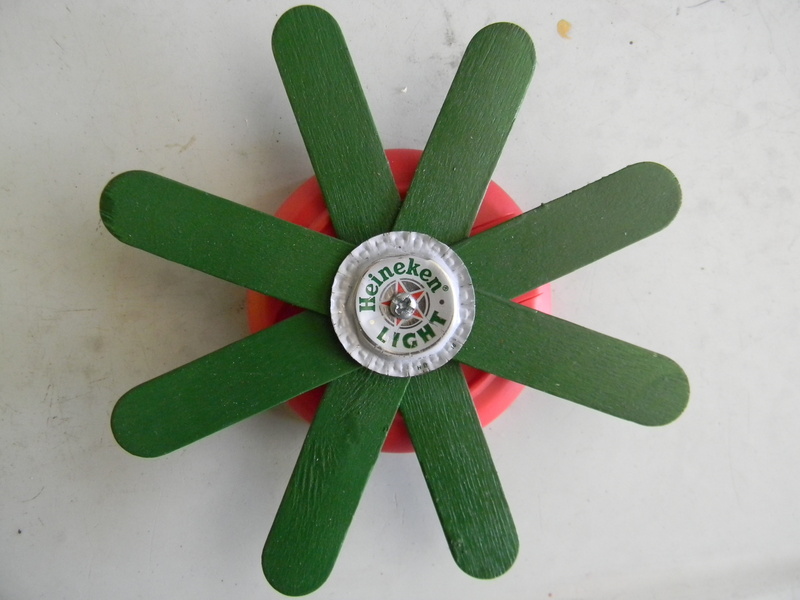 Those were SO fun to make. And you’re right. I did find stuff here to recycle. Go figure. LOL Have a great weekend, my friend! Loved it. Shared some photos on Pinterest! Thank you, Susan. I’m glad you enjoyed it. And thanks for sharing on Pinterest. See you soon! Kathy, You are the most creative person I know! How you manage to take such everyday stuff, trash and turn it into something beautiful to behold, is beyond me! I love it. I’m not as crafty, or talented and the process seems overwhelming, but kudos to you for not only doing it but showing others through your step by step process. Here’s what I do: I re-use every gift bag I receive. I like the map idea. That’s definitely something I can do that’s easy. Oh, and I never use bows or stuff like that. Very timely post! I seem to remember something about a scrapbook or two that you’ve done, so I don’t know that I buy you’re not being crafty and creative. Still, I’m so glad you enjoyed these ideas. I think I mostly love the process of coming up with new ideas. Maps are great fun to use. DO give it a go! Hope you’ve had a wonderful weekend, my friend. Kathy, we’ve done this in previous years, especially with members of our immediate family. Usually we just wrap our gifts in the local newspaper that Barry works for. 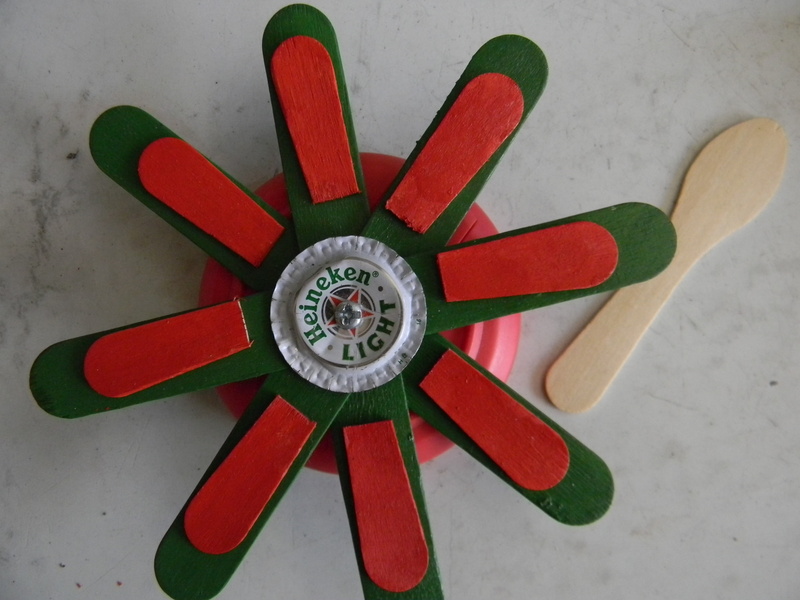 I like the additions of popsicle sticks and bottle caps. Livens things up. We’re going to Georgia for Christmas so shall start pondering some ideas right now. This is truly inspirational! Thank you so much, Kathy! I’m tickled you enjoyed these ideas. I will be curious to see what you come up with. I, too, love to wrap with newspaper. It’s the perfect paper in so many ways. Just saw a post in my inbox from you–something about the cold–INDOORS–so, stay warm this evening! Great to hear from you! I don’t “like,” I LOOOooooooOVE! And to top it off…”Writing Down The Bones!! !” YESsss. Yippee! You have made my day, Kimmy! I love your enthusiasm. And you, too, are a lover of “Writing Down the Bones!” That makes me LOVE YOU even more! Hugs to you, dear Kim! I remember last year’s post … so cheers to your creativity. Thanks, Frank. 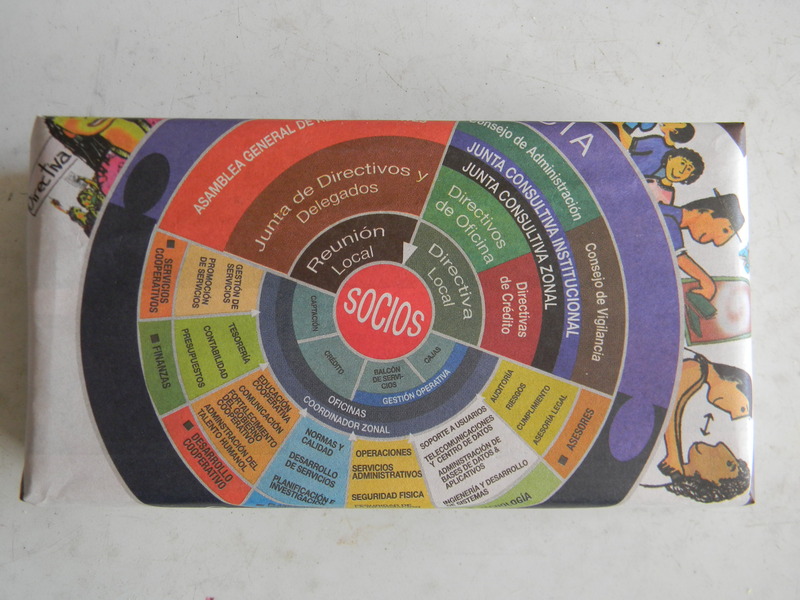 It was fun to do last year and fun to come up with new ideas based on Ecuador’s trash. 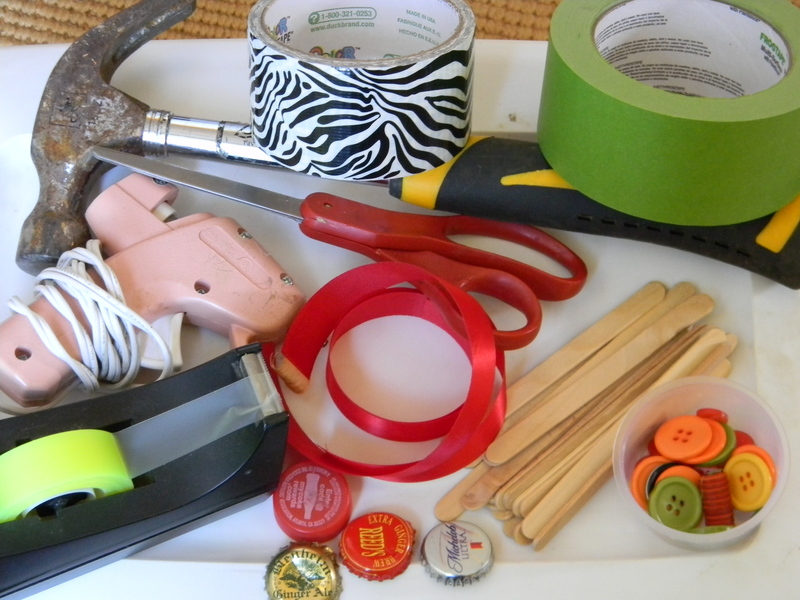 Who knew garbage could make for great crafting–and wrapping! I was so sorry to hear about your mother-in-law. Must have been a tough weekend. It was a tough week … but those circumstances are never easy … so I hope this week is in the direction of normal. Thanks for the kind thoughts. Love your marvellous wrapping job ! One year I wrapped everything in discarded maps I found in the recycling box at the University where I worked. GOOD for you! That’s awesome. I’d love to come across a bunch of discarded maps. Interestingly, my post tomorrow is about make Christmas tree ornaments from maps. Thanks so much for stopping by. It’s great to hear from you!!!! Really Nice ideas. I always use old newspapers to wrap présent. 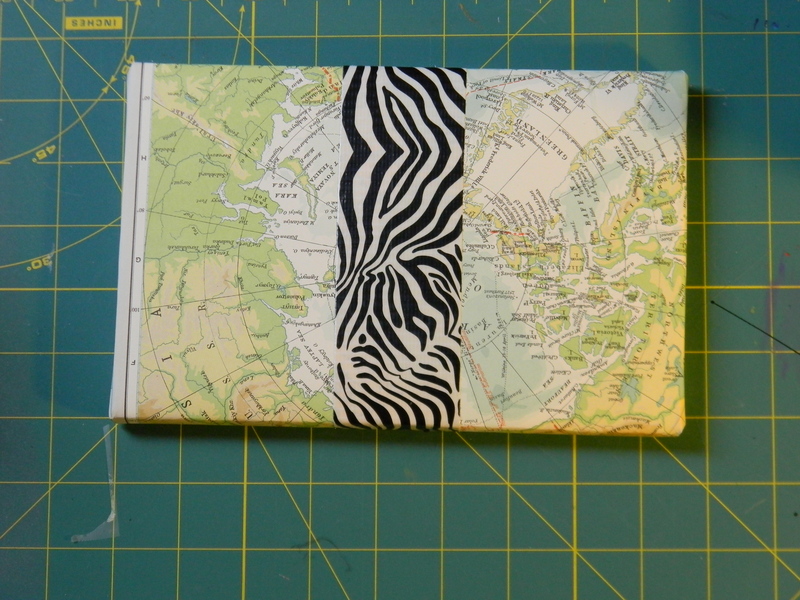 I Also uses magazine to make envelopes and create that way an original letter sending. We have plenty of old road maps. I think I’ll start using them. And Writing Down the Bones is one of my favorite books. Are you really giving it as a gift, or was that for demonstration purposes only? Yes, it really was a gift. It’s one of my favorites, as well. I love Natalie Goldberg. 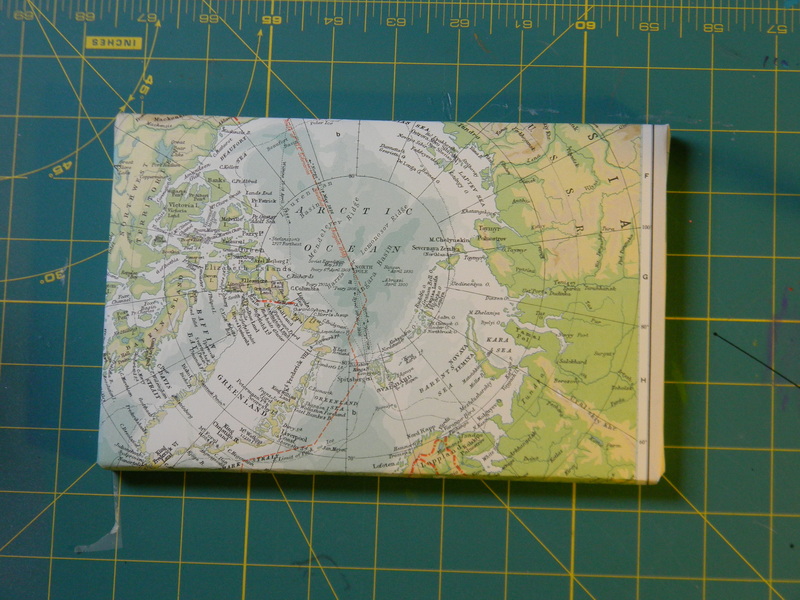 I’d love to know how your wrapping with maps goes. Good luck with your cartography creations. Great to hear from you today. Hope your week is going well! Thanks for stopping by! I think Natalie Goldberg would love your wild wrappings, Kathy. I just reread her “Writing Down the Bones” as preparation for the Blue Deer Writers Workshops I want to lead here at home beginning in January. (So far my newspaper press release has led to their suggesting I run a $198 one-time ad….) 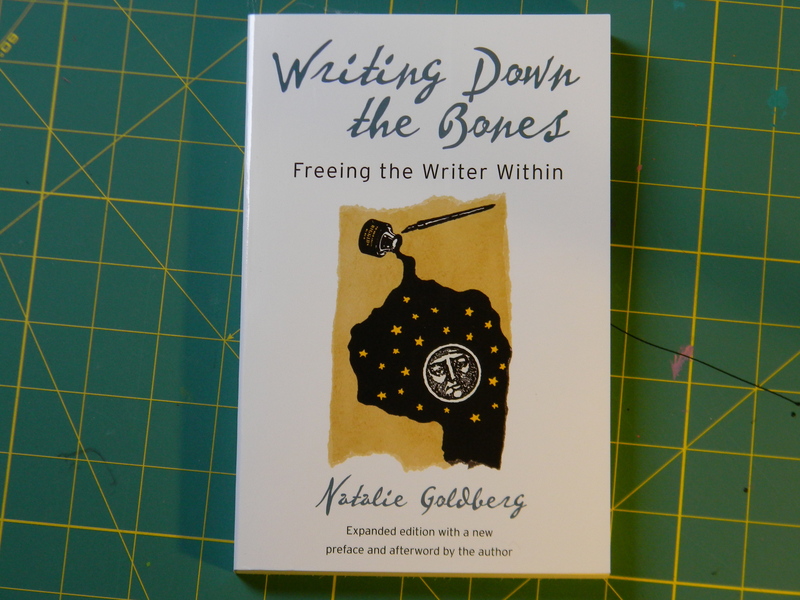 I, too, love Natalie Goldberg’s writing and “Bones” enabled me, years ago, to override my inner critic. I love your creative sculptures. As near as I’ve gotten this year is placing a tipsy angel atop my 8-foot (artificial) Christmas tree. Trust me, I was at the top of the ladder holding onto the ceiling while the tree wobbled and the lights throwing shadows on the ceiling made it look as if the ceiling was spinning. I probably should have drunk a glass of wine first…. I thanked my friend Robert for the shout-out. That was kind. Glad to hear you, too are a Goldberg fan. Gotta love a writer who can help other writers silence the critic inside. He or she can be a serious enemy to the writing process. And I’m even more tickled you enjoyed the wrapping. Thank God you didn’t fall putting the angel atop your tree. Yes, Robert is a sweetie, isn’t he?! Almost forgot–almost $200 for an ad? Wow. That’s a lot of money! Yes, Robert is a good friend. He is to me as Milton is to Virginia, I believe — my go-to person who is willing to lend an ear while I talk at him. Actually, it’s reciprocal. You don’t need to reply to this, Kathy, but I just wanted to congratulate you on being Freshly Pressed — and wow! Look at the shower of comments. You’ll have to add more stockings to your mantelpiece. Kathy, your artistic eye sees possibility in everything. Sadly, I don’t think through things well enough. I create way too much trash. I’m going to remember this next year and do a better job. Oh, and congratulations on being Freshly Pressed! Thanks, Andra. It’s supposed to happen tomorrow, I think. Hope you and MTM have a happy holiday! Thanks, Andra. I’m afraid, Sara sometimes considers that more of a curse than a blessing–at times I were willing to recognize more as actual trash. Alas–we all have our crosses to bear. I live in Quito, and always have a hard time figuring out how to wrap presents. Wrapping paper is just too expensive! These are some really great ideas. Oh, cool! How wonderful to hear from you. I’m going to be in Quito between Christmas and New Years. And this will be my first trip. Can’t wait. Yeah, isn’t it weird what’s expensive here and what isn’t? I’m glad you enjoyed the post, and, perhaps, solved one of your own wrapping issues. Once the Freshly Pressed frenzy quiets down, I look forward to visiting your blog! By the way, do you have a hotel that you’d recommend–medium price? It is between 50-70 a night, depending on the room and the dates. My dad said it was a very nice place! I hope this helps. Have a safe trip home. And thanks so much for the link. I will check it out. I know what you mean about it being hard to find time to write. Hope you have a great holiday with your family in the US! This year we used our “trash” for gifts as well! Save all of the lint your dryer collects and all of your empty toilet paper rolls. Fill each roll with lint, wrap with recycled paper or gift wrap (make sure you use something that you can burn), tie the ends off with pretty ribbon and put in gift baskets as fire starters for folks with wood-burning fireplaces or outdoor wood-burning fire pits. Very fun for crafters of all ages! Merry Christmas! I totally LOVE your idea! I’m fascinated by the organic kinds of designs that appear on dryer lint, but your idea is SO practical. We don’t have a dryer here in Ecuador, or I might try your gift making strategy. Too fun. Happy holidays to your and your family, and thanks SO much for stopping by! Great post. The tons and tons of garbage that we keep generating often makes me wonder when we would need to relocate to another planet! We surely need more such posts from you!! Thank you! I’m so glad you enjoyed the post. You’re right. We generate WAY more trash than we have room for on our planet. If we reuse what we would otherwise throw away, it begins to make a dent in the problem. I appreciate your stopping by. Happy holidays to you! Thank you. Wish you and yours a great festive season! Did you do this your self cuz this looks AWESOME HOW COMING TO SEE MY BLOG???? Yes, I did do this myself. So glad you like it. You should try it yourself. It’s fun. I will visit your blog as soon at this Freshly Pressed craziness dies down. Thanks so much for stopping by. Happy holidays! Nice piece. I hope others follow your lead. Thank you! I hope others will try this, as well. It’s free, and fun, which is a hard combination to beat. I appreciate your stopping by and taking the time to leave a comment. Have a wonderful holiday! Yes, indeed. It’s each of those things. Plus, it’s really fun. Thanks for taking a look and leaving me a comment. Happy holidays to your and your family! Thanks so much. Glad you like the wrapping. Happy holidays to you! I love these ideas and found them too late, next year I will re-use paper and teach my children a fantastic lesson on re-cycling thank you for sharing, very creative ideas. Well, I guess it’s good that you have your wrapping done. And it’s great you will recycle wrapping next year. You’re right. It’s a great lesson to teach kids. Hope you and your family have a fabulous holiday. And I hope you’ll stop by again soon. Kathryn happy festive season and yes I will come back to read more when I have time. Thanks for sharing my post with your readers. Thank you! Glad you enjoyed it. Merry Christmas and Happy New Year. This is very neat! I love the way these things look. Also the fact that you are using things that would have been thrown away makes it even cooler. Helping the environment is something that I always try to do so when I see someone else doing it I feel hopeful about the future of the human race. I think I know how you feel. If we keep on our current path, so will destroy the planet. If we make these kinds of small changes, then there’s hope for all of us. Hope you have fabulous holiday. And please come by again soon! Not only am I glad I saw this before FP, but I’m proud to share the current FP page with my friend! You are SUCH a sweetie, Frank! I’m honored to share it with you! You are so awesomeable too! Thank you, dear Colleen. You saw Freshly Pressed. I was pretty excited when I got the email a couple of days ago telling me this post would have that honor. Hugs to you, too, my friend! YES! Way coincidental. Hope you and David have a great holiday, Colleen. Just trying to steal a minute here to catch up on Freshly Pressed comments. We have guests here from the US. Merry Christmas Kathy. Be well! And happy! I love creativity of all kinds! Me too. It’s fun isn’t it? Sounds like an ad for ebay. Though it’s true. You can save money. Happy holidays. Thanks. So glad you liked the post. Hope you have a lovely holiday! Lol true sorry if it came across that way. Happy holidays to you too!!! No need to apologize. Have a great holiday. Very creative packaging! I, too , love to use whatever I can find that seems to fit the theme for the gift. I have attached dried flowers, grasses, pine cones, recycled ribbons from past Christmas or birthday gifts. I also cut out images from junk mail and keep it in a box, mostly for collages, but every once in a while, I’ll swipe an image and make a little greeting card out of it, that gets attached to the wrapped gift. These are all wonderful ideas. I, too, love to use dried flowers. And I love to make cards. I hadn’t even thought about incorporating junk mail into that. Thanks for the idea. Thanks for stopping by and taking the time to leave a comment. Happy holidays. So glad you like the wrapping. Hope you and your family have a lovely holiday. Please come back by again soon. I appreciate your taking the time to leave a comment. What a great teacher you are. These step by step directions make it look easy. A couple of years ago I tried my hand at your styrofoam Christmas ornaments that came out with a quilted effect. I tried holiday wrap, too thick. Then I tried cotton squares with small patterns. Worked well. 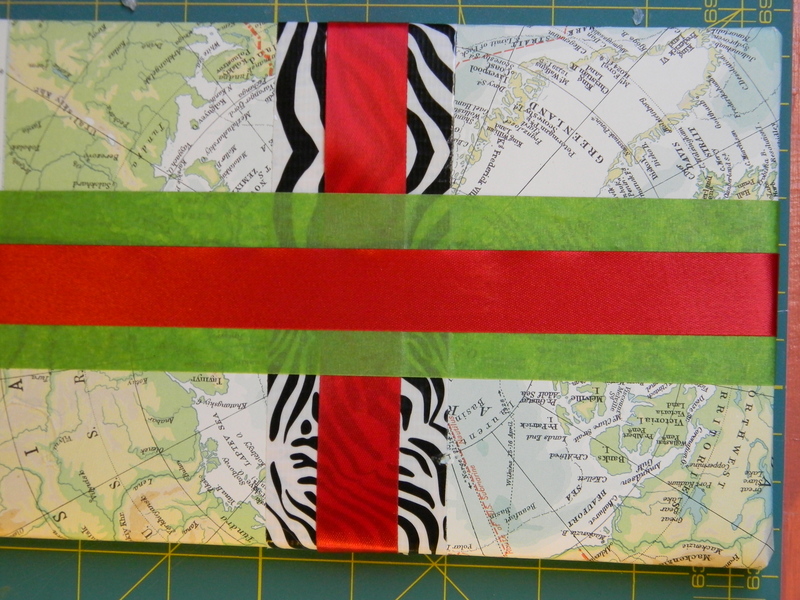 Then I tried thin tissue paper with holiday patterns…perfect. I book marked those directions and now I’ve lost them…please remind me of the link. Now that should have been freshly pressed, too. Congratulations on this FP. You are very creative and generous to share your ideas. This Christmas, I’ve snipped old Christmas cards to serve as Christmas tags on gifts this year. PS A very dear friend’s in-laws live in Cuenca and years ago I spent a summer in Quito and Guayaquil. Feliz Navidad y un Próspero Año Nuevo. It’s wonderful to hear from you. Glad you enjoyed this post and the one about making ornaments. I had never tried using tissue paper, so thanks for that tip. I will give it a shot. I did a post similar to the one I did last year about ornament making. However, this year I focused on using trash I found here in Ecuador. The link for the original tutorial is: https://reinventingtheeventhorizon.wordpress.com/2011/12/05/a-holiday-ecology-making-ornaments-from-recycled-trash/ . How cool that you know folks here in Cuenca and have spent time here in Ecuador, yourself. Merry Christmas and Happy New Year to you, too. Hope you’ll come by again soon. Thanks, Matt! Glad you enjoyed it. Please come by again soon! Love this! I thought I was being creative by using Canadian Tire flyers for wrapping paper, haha. Thanks so much. Glad you enjoyed it. But, heck, I think using tire flyers is a GREAT idea! Have a lovely holiday. What an amazing idea. Who knew wrapping presents in trash could look so pretty? I love the last one the best. So glad you enjoyed the post. I will have to go back and see which photo came last. Thanks for leaving a comment. Hope you have a lovely holiday. Heey, I know you…You read all the blogs I stalk. 🙂 Congrats on the FP! This is such a clever and cute way to wrap gifts. I deemed this Christmas “The Year of the Soap” and I’ve been wrapping the little fragrant bars in hand-knitted washcloths. How cool that we read the same blogs. I’m going to have to visit yours, as well. Gotta love the YEAR OF THE SOAP. What a hoot. And how fun that you knit washcloths. Hope you and your family have a lovely holiday! Thanks for sharing my post with your reader. I’d love you to come back! Have a lovely holiday! I love things like that! Newspaper and twine are some of my favourite wrappings for gifts. I never thought to use old flyers, though. I’ll have to try that soon. 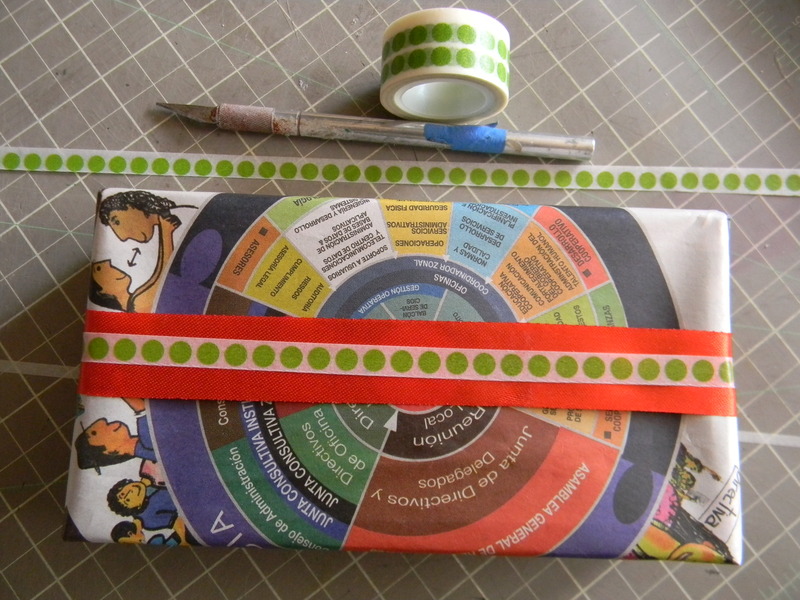 I have a friend who uses foreign newspapers for wrapping and he would love this idea. This is amaying. It can~t be called up/czcling anzmore, this is straight out ART! 😀 After receiving something this beautiful it should definitely be kept as decoration in the room. Great post! Such a great idea!! These are adorable, plus they don’t contribute to the trash epidemic we’re facing. I will have to try these out. Craze here for turning a book into a decorative Christmas tree. Anyone know how? Wow!!!!!! This is really simple,beautiful, creative and also personal. All at the same time! Genius. This is so cute! I love all the colours and the way you reused different items! 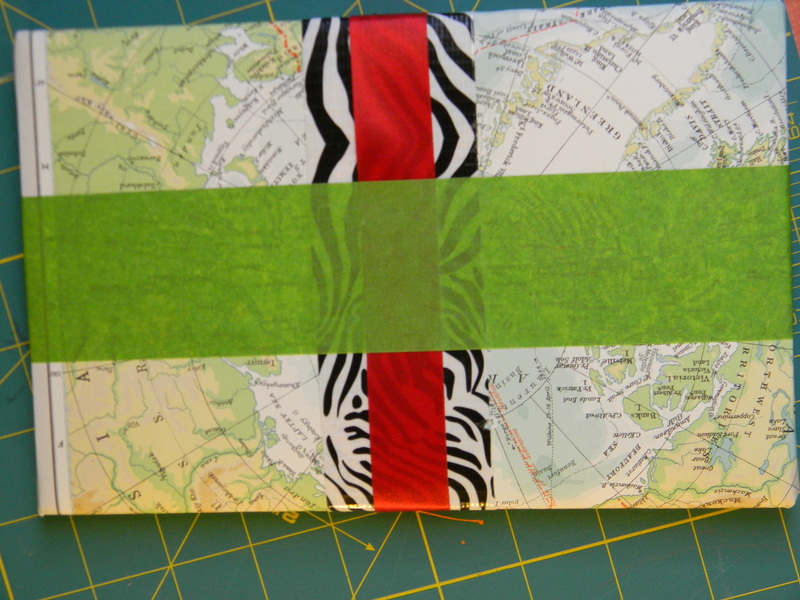 I probably won’t do exactly this but am definitely inspired to get funky with my own wrapping. This is way cool! I would have never thought of using some of these things! Thanks for sharing! When I was in South Africa a few months back, I saw amazing art created from junk. This is a similar sort of idea, and it looks fantastic. What a fun, creative idea. Than you for sharing. Very nice! But a bit time consuming. In years past, I used pages from the LA Times rotagravure, or comic pages, or pages from a Chinese newspaper. One year, Hanukkah came early, which meant that Hanukkah wrap was on sale before Christmas–so my outgoing presents had little dredels on them. I don’t think anyone noticed. What a fun, creative, and great way to go green. This is very, very creative. I love all the detailed photos. Thanks for posting. I love your blog!! So creative! I love the color. So inspiring! I preferred the wrapper before the final flower. I imagine it was a lot of fun to do it. This is so creative, I really love handmade and knowing that even a gift wrapping can be done creatively, it will be more appreciated by someone,for sure! Thanks for sharing and I’m so happy to find your blog! My sister has been doing similar wrapping/cards for years – and its so fun to receive them from her! The originality, the colors, and the textures are always such a treat! Thanks for sharing your cool ideas with us! I especially like the map idea! This is an amazing and creative idea, the wrapping looks wonderful. I will love to receive a present with that wrapping! My friends and I use fabric offcuts and ribbon and we save the ones we’re given to reuse every year. Your presents look MUCH MUCH better than ours though! The way ours look at the end, you can only give them to someone who understands what you’re doing and why! dude your blog really helped thx! This is so cool! Since moving to the country I have cut my trash by 2/3 and now I may be able to up-cycle in ways I had never imagined. Thanks! Good for you! It’s amazing what we can reuse–and in the most amazing and imaginative ways! Thanks for your comment. Please come back again soon! Our trash has decreased by 2/3 since the move to the country but now I think it may be possible to decrease it even more! Check out these ideas! My family has taken to using re-usable gift boxes and bags more-so than paper. It makes wrapping much faster, and clean up a lot easier on Christmas. Gift bags are an awesome alternative. Good for you and your family. Great to hear from you. Thanks for leaving a comment. Hope you will come by again soon. beautifully documentated, delightful blog. Now all i need are presents to give away.. Thank you, such a sweet comment. I appreciate your stopping by and taking the time to share. Hope you will come back again soon. great way to shift all the trash i seem to collect. but i need a couple more tools. this year we received a HUGE four pound box of chocolates for xmas and I will recover it and use for a gift. Yes, recovering used boxes is an excellent idea. Thanks for reading and taking the time to leave a comment. Great to hear from you! Thanks so much. I’m glad you enjoyed the post! This was a fun one to do. Hope you’ll stop back again soon. I appreciate your taking the time to leave a comment. Hope your week is going well! I love the idea to use what may be lying around the home or office. Thanks so much for sharing my post with your readers! Thank you! So glad you enjoyed it! Hope you’ll come back again soon. Thanks so much. Glad you enjoyed the post. Hope you will try to do some creative wrapping of your own one of these days!